WANT TO LEARN HOW TO CREATE A WEBSITE? Inside BOOK + DVD, You Learn How to Create a Website using HTML; How to Create a Blog; How to Create a Facebook Business Website & Lots More. "WOW! This tin no hard as I tink am sef!" 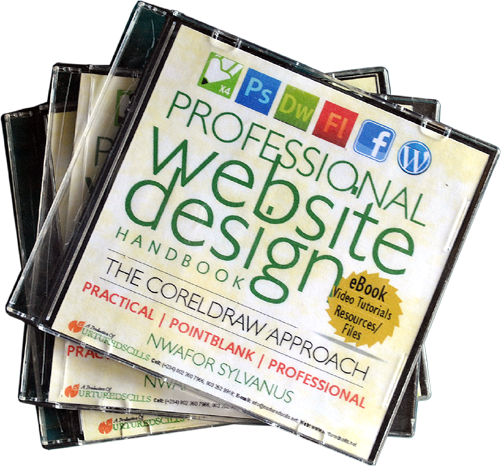 Attending our web design training course qualifies you for a FREE BOOK + DVD. The video tutorials are very crisp, clear with great audio quality like no other in Nigeria. They are indepth and exhaustive lessons that explains in clear details how you can systematically build a unique website, blog all on your own. You can play, pause, rewind severally and learn at your own pace." The idea for the Professional Website Design Handbook + DVD started with identifying a need we feel must be met. 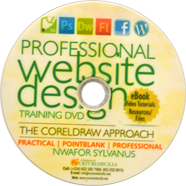 Most of our computer training centres in Nigeria offers training that included Coreldraw. But how about training on web design with Coreldraw? There was actually non! We took the initiative and decided to do a complete website design training course that includes an over 166 page book; over 50 step-by-step video tutorials and original resources. See sample pages of book which are actually selected parts of the beautifully designed, easy to read book. Copyright © 2016 Nurturedscills Limited. All rights reserved.